By the time North and South Korea returned to the bargaining table, both sides (and their respective allies) had sustained many casualties and had spent huge amounts of money fighting to an impasse. Rare photographs from the U.S. National Archives, presented here in chronological order, provide some evidence of the fierce fighting and its consequences. American men from the 24th Infantry Regiment move up to the firing line on July 18, 1950. Thousands of American troops arrive in Korea on 6 August 1950, as part of the UN effort to assist South Korea. On 28 August 1950, a grief-stricken American infantryman mourns the loss of his buddy while a nearby medic fills out the paperwork. In September, 1950, U.S. Marines engaged in combat in Seoul while a machine-gun crew fires at fleeing targets in the captured city of Waegwan. A woman searches through the rubble of Seoul on November 1, 1950. Korean refuges, on their way south, trudge through the snow and ice outside Kangning on January 8, 1951. In January of 1951, B-29s of the U.S. Far East Air Forces participated in round-the-clock attacks on strategic Chinese military targets in North Korea. Paratroopers, packed into a C-119 "Flying Boxcar," routinely flew to "drop zones" as they began actual or practice airborne assaults. The UN weapon North Koreans feared the most, according to prisoner interrogation, was the napalm fire bomb. In August of 1951, two napalm bombs just released from shackles underneath the wing of an F-51 "Mustang," are on their way to an industrial target. Sometimes the targets were enemy supply points, like this view—near Hanchon, North Korea—where thatched huts also went up in flames on May 10, 1951. One F-80 "Shooting Star" banks sharply as it lines up a June, 1951 target while another prepares to drop 150 gallons of napalm (75 gallons in each bomb) over a separate target. A Korean girl, with her brother on her back, tries to make her way to safety on June 9, 1951. Torrential rains interfered with, but did not stop, UN bombing missions. A high-velocity rocket, sent to its target by an F-9F "Pantherjet," in August of 1951. 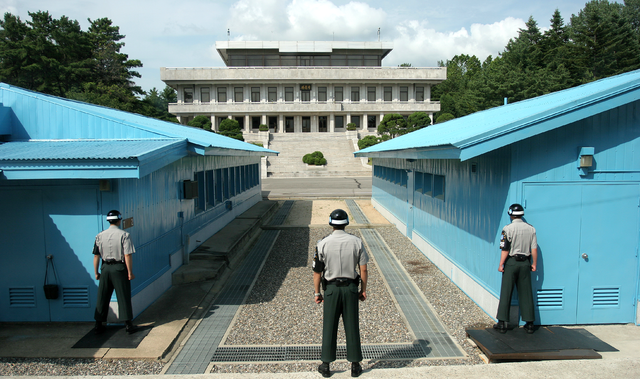 Peace talks at Kaesong, Korea, did not end the conflict in 1951. U.S. Air Force B-26 "Night Intruders" carried out daily bombing runs, even in bad weather, in an effort to disrupt enemy supply lines. 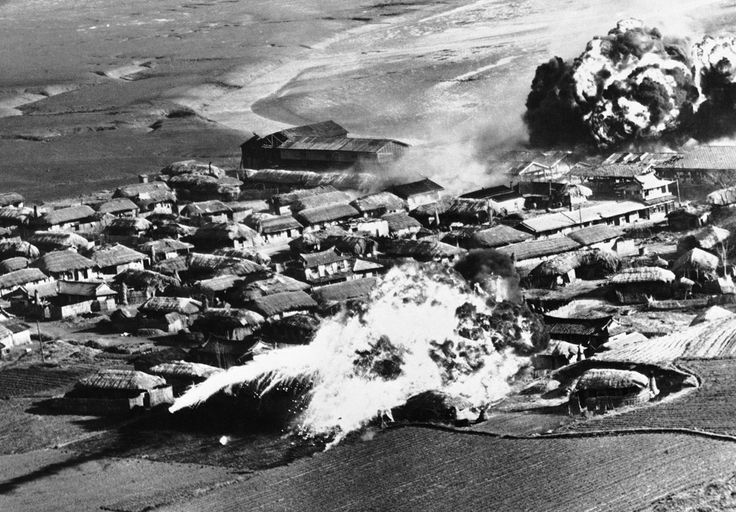 Supply warehouses and dock facilities - in the North Korean east-coast port of Wonsan - are destroyed by para-demolition bombs dropped from B-26 Invaders, circa 1951. On May 8, 1952 an F-80 drops another napalm bomb. President Truman, already reluctant to commit American forces to fight with the United Nations when South Korea first asked for American help, was beside himself by the spring of 1952. His diary entry for May 18 reveals a President distraught over promises made (then broken) by his Communist opposition. He was also extremely concerned with the way UN prisoners of war were being treated. F-86 "Sabre" jets of the 51st Fighter Interceptor Wing flew over Korea's mountainous terrain in October of 1952. In the spring of 1953, the UN and North Korea agreed to repatriate Prisoners of War. "Freedom Village" welcomed back UN POWs at Munsan-ni. On 21 September 1953, a North Korean pilot flew a MiG 15 to a US Air Force base at Kimpo, near Seoul. He had defected. The inevitable tragedy of war - death and life-changing injuries - also characterized the Korean Conflict. Executed prisoners-of-war, homeless children, victims of massacres and war atrocities (this is a PDF link) were all part of what some scholars call "the forgotten war." What took place in Korea, however, was not forgotten by those who were there. Clint Eastwood, a Korean-War veteran, has even made a film - "Gran Torino" - about one soldier named Walt Kowalski. Bos, Carole "KOREAN WAR PICTURES" AwesomeStories.com. Jun 01, 2008. Apr 25, 2019.